Municipalities adjoining middle size cities are subject to peculiar dynamics: competition on a real estate price basis, and sometime on grounds of less strict codes than the central city are a constant, but in these municipalities position values are higher due to the highway infrastructure improvements related to central city accesses. Furthermore, the existence of virgin land that can channeled to proposals more adapted to market demand with comparatively lower management costs than in central cities is also a factor. 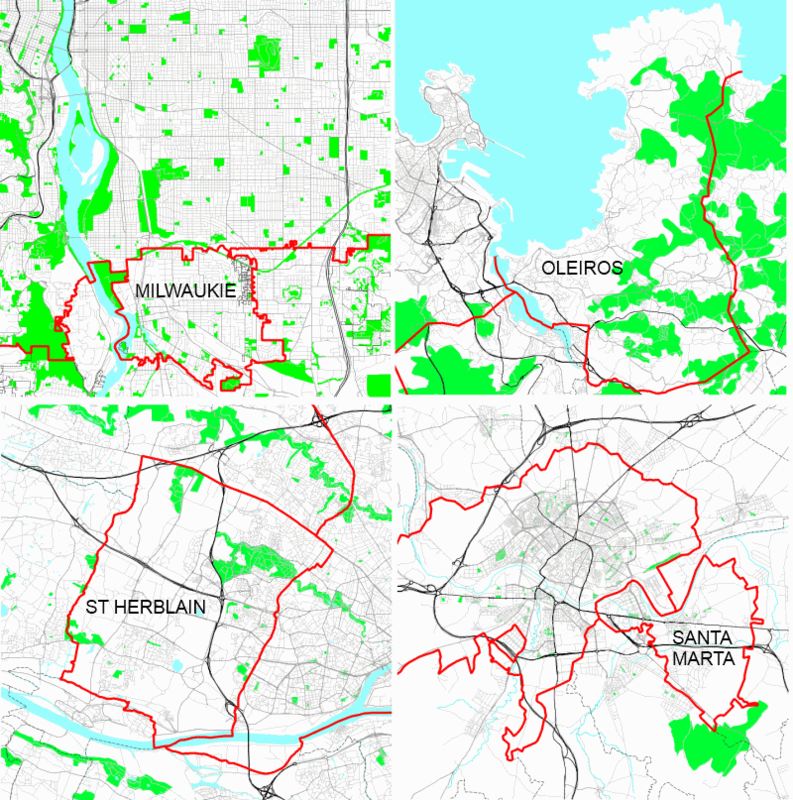 The following four municipalities (two in Spain, one in France and one in the United States) share that condition, being adjacent to central cities of midsize urban areas (each in its country) in different geographical contexts. I know Oleiros as I have lived in La Coruña for 30 years; I have worked for ten years coordinating the team for the Santa Marta’s Plan General; and I know St Herblain from visits to Nantes, an interesting city. I have never been to Oregon, but Milwaukie seemed a good case in the American context. Santa Marta de Tormes (population nearly 15.000) shares municipal boundaries with the capital of the province of Salamanca (metropolitan population near 190.000). 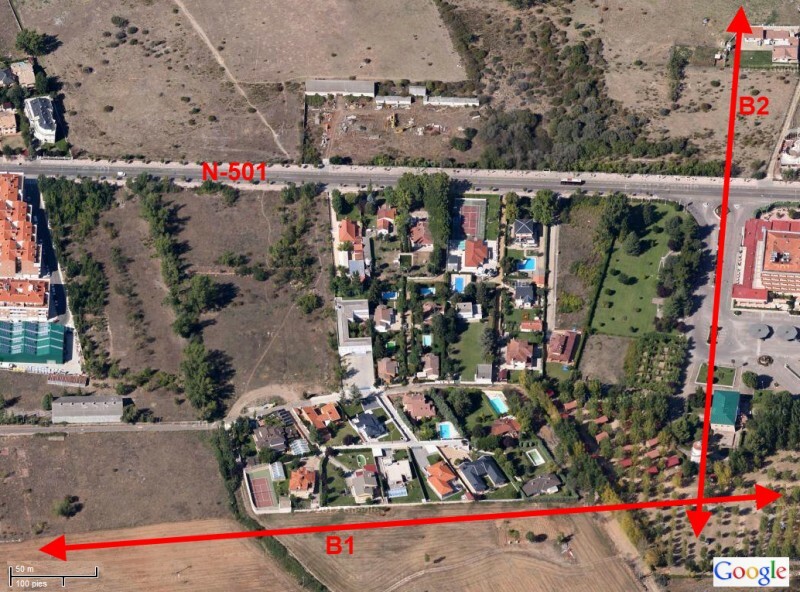 Urban development during the XXth century has been linked to N-501 road to Madrid, on which is located the original settlement. Growth gained momentum during the 1970’s with large scale developments of detached housing south of the bypass expressway, in fact starting the development of peripheral municipalities. Growth has been fast, with a large share of detached housing surrounding a dense original core which shares most of the drawbacks of 1960-1980 Spanish urban areas: a dismal urban space (recently subject to requalification operations), scarce parks and public facilities, and a housing stock of lesser quality. 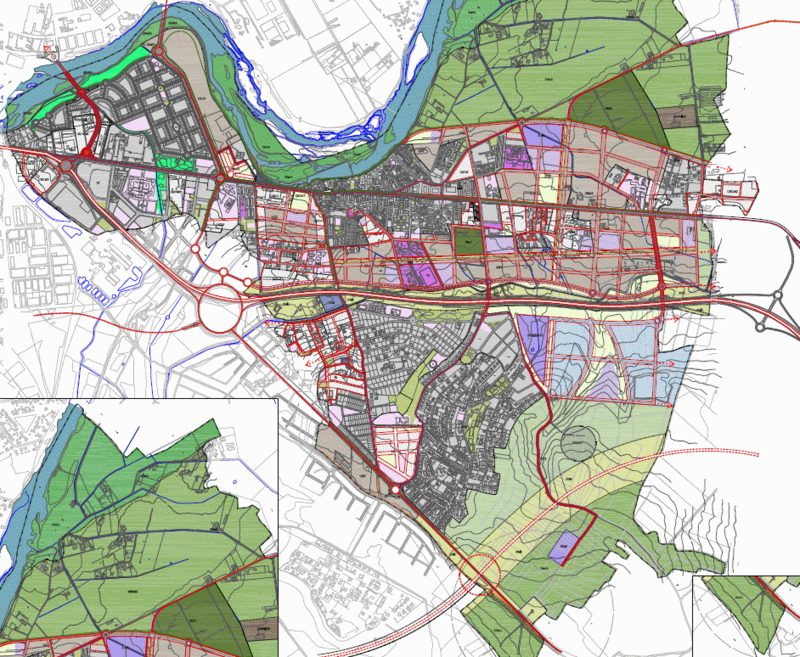 – Concentration of residential growth in the central area of the municipality, north of the expressway, filling a present patchwork of disparate elements and giving coherence to future tissue. The proposed density is on average 35 housing units by hectare, combining individual and multifamily housing. It is difficult to predict a time for this development taking into account the present crisis context, but the priority is put on the future urban structure. – Provision of a set of boulevards irrigating the new residential areas, including a priority for walking an cycling, and a possible development as public transit corridors. 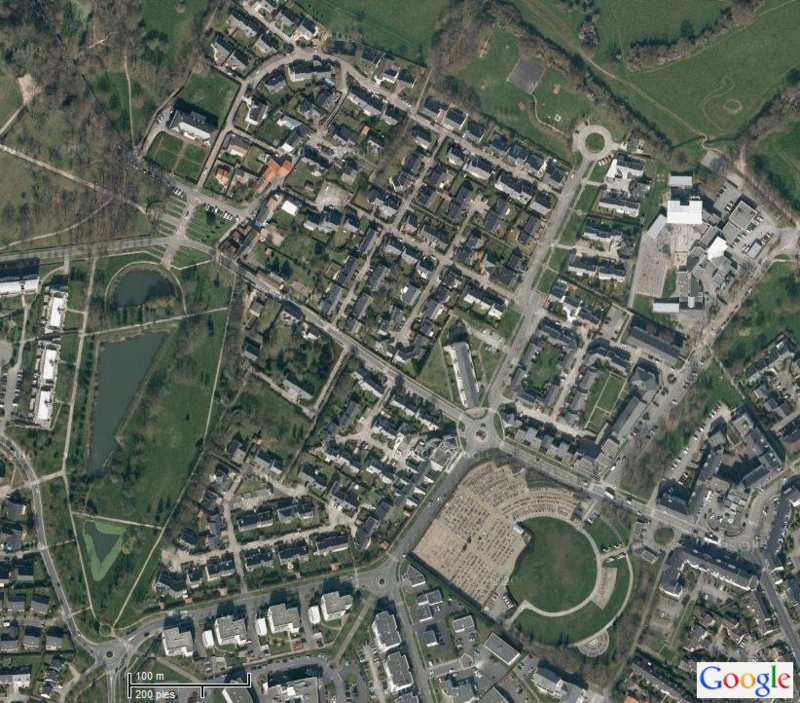 The plan provides a system of large public facilities and parks in the growth areas. Peripheral bypass local roads are aimed at reducing car traffic in new residential areas. – New industrial and business areas south of the expressway. Improvement in the road connections to central Salamanca through a new bridge over the river Tormes. 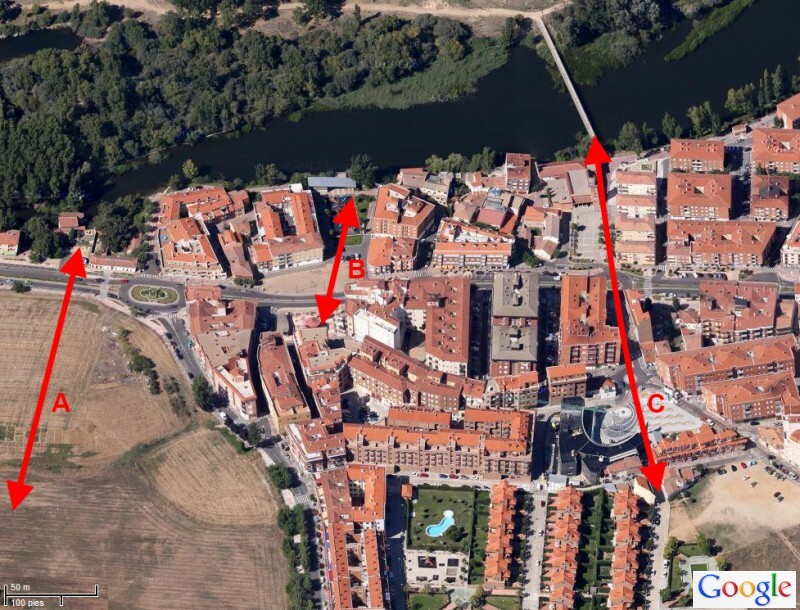 Urban core of Santa Marta de Tormes and improvements in the relation with the river Tormes : A) project for a new park related to the river, B) opening of visual connexion between Plaza Mayor and the embankment, C) integration of the new City Hall with the river and the island of El Soto. Growth areas in Santa Marta de Tormes, integrating previously occupied tissues in the grid defined by the N-501 and the new boulevards (B1, B2). 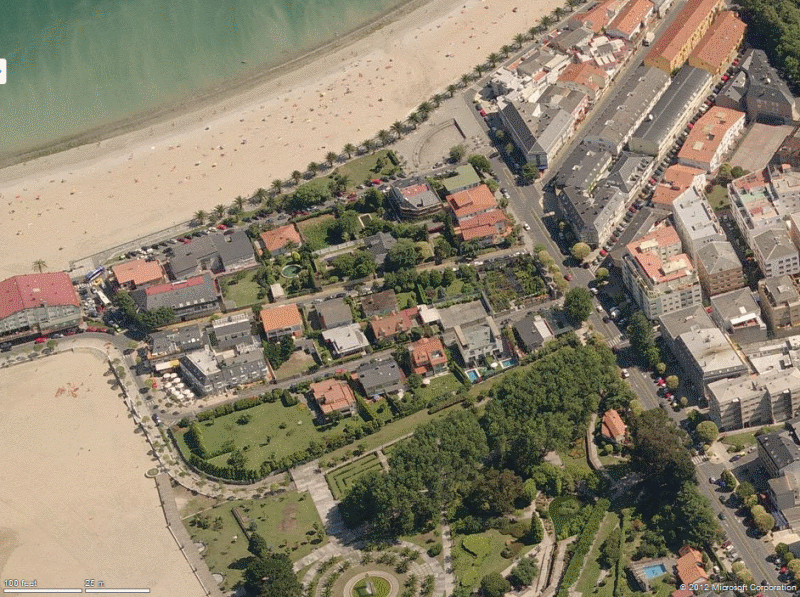 Oleiros (population slightly over 34.000) is separated from the provintial capital of Coruña (metropolitan population 410.000) by the El Burgo estuary. 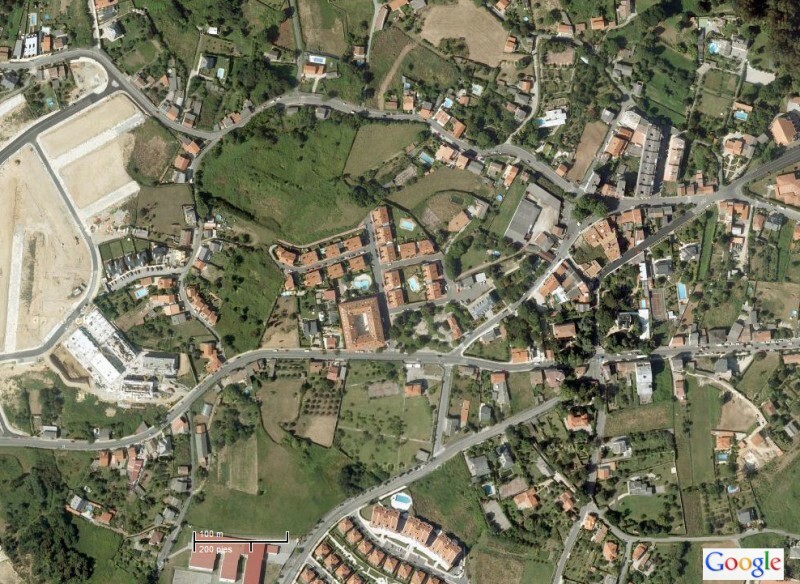 As often in Galicia, there is no single main settlement, but an array of small ones distributed over the municipality. Urban growth during the XXth century was conditioned by improvements in N-VI road to Madrid, and even more by the AC173 road linking the city to the less exposed eastern beaches. An initial surge in holiday housing around beaches developed on a tradition of low density rural sprawl and a network of small paths and hamlets. Over time, these holiday houses became main permanent residences. 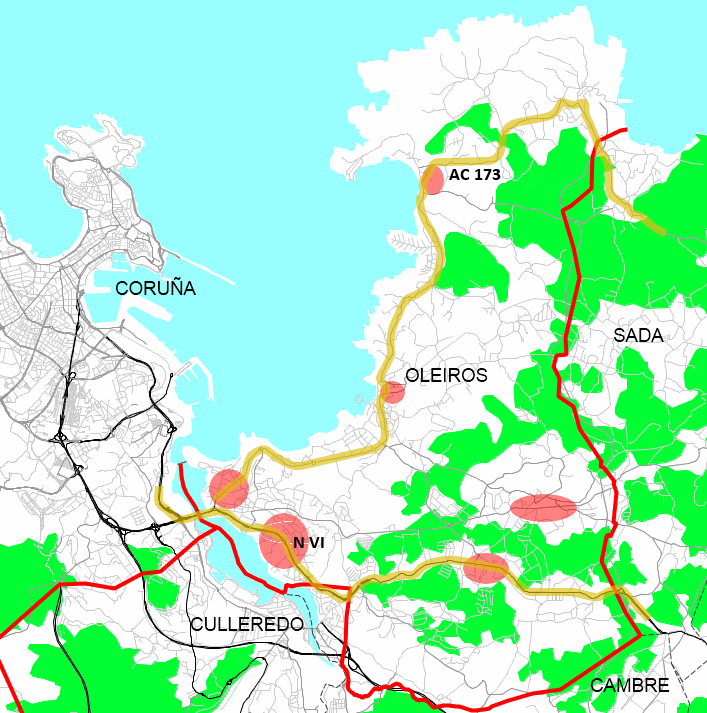 The 2009 Oleiros Plan Xeral, a municipal project without a metropolitan planning reference, protects from development the northern coastal strip and some ecologically significant internal spaces. The Plan aims to grow in continuity with the many areas already urbanized, often with a rural origin, and to improve a public facilities system that is already good from a regional perspective. There is also a will to integrate a coastal landscape quality element in the growth strategy; the recent approval of the Galician Coastal Plan, including Oleiros, helps in that sense and gives coherence to works on coastal areas on a metropolitan scale. Central area of the Oleiros municipality. The City hall is on the right part of the image. 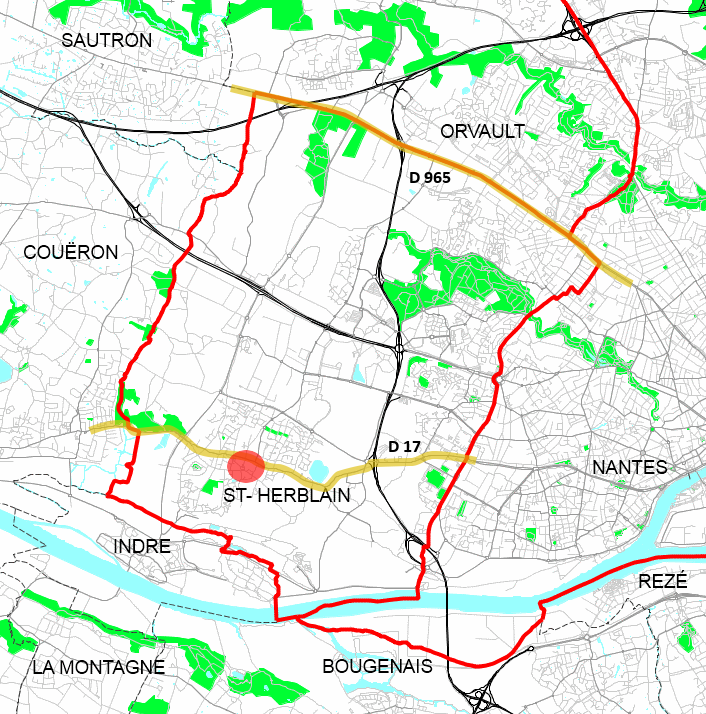 St Herblain (population 44.000) shares municipal borders to the east with Nantes (population 590.000 for the whole metropolitan area), the old capital of the Britanny Dukes. In a context in which there was traditionally some settlement dispersion, the urban growth during the XXth century has been linked to the improvements of roads D965 (Nantes- Vannes) and D-17 (more local path on which sits the municipality main settlement). 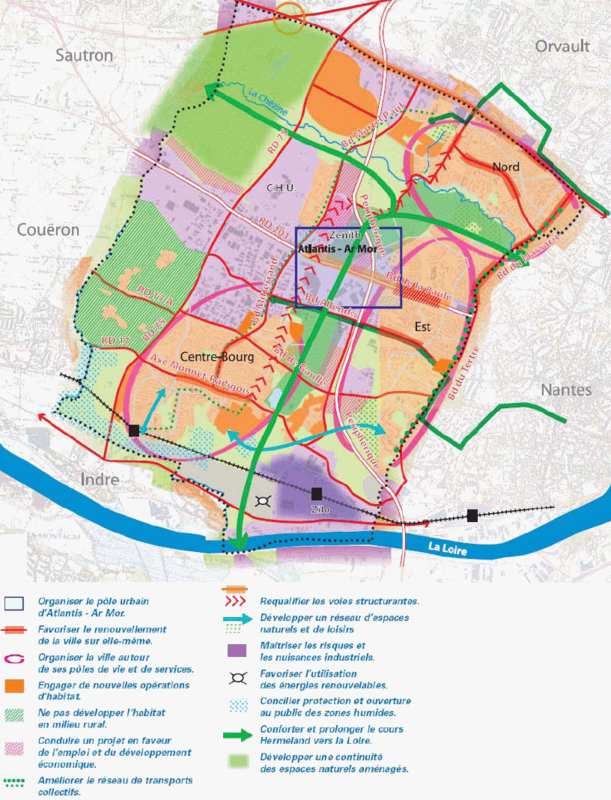 The municipality is also crossed by the Nantes Beltway (peripherique) and the Saint Nazaire Expressway (RD 201). Today the RD 201 is occupied by business areas, configuring a territorial system in which three residential areas (Centre Bourg, Est and Nord) surround a central industrial and big box retail area. The housing stock shows a large proportion of single family units and some large multifamily social housing developments from the sixties, subject to improvement projects agreed upon by the municipality and the National Urban Renovation Agency. – A diversified city: living in the city and in your neighborhood. – The Plan defines a system of green corridors to ensure a continuite from the Chezine valley in the north to the Loire in the south, a requalification for the structural routes between the historical core and the north, specific measures in the south to tackle industrial risks and to promote renewable generation in the area (wind farms, high efficiency heath networks), and growth areas on the fringes of the current tissues as well as in a new northwest neighborhood. Historical core of St Herblain. 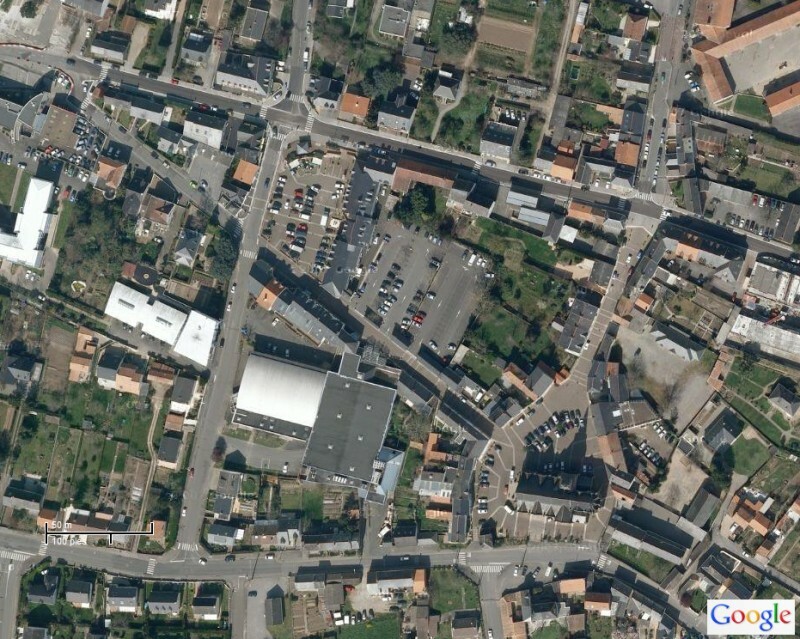 The historical layout can be recognized, with clear alterations in the void- built pattern due to the parking lots. Recent residential tissue in northern St Herblain, with a majority of single family housing units and presence of multifamily units to the south. Milwaukie (population 20.300) is a city in the Portland, Oregon, metropolitan area (population 1.556.000), established in 1847 on the Willamette river. The river was the main way to the city until the beginning of the XXth century. The opening of McLoughlin Bvd in 1932 as the main thoroughfare connecting Portland and the upper Willamette valley, the main agricultural area of the state, and the railroad, allowed an effective integration into the metropolitan area. 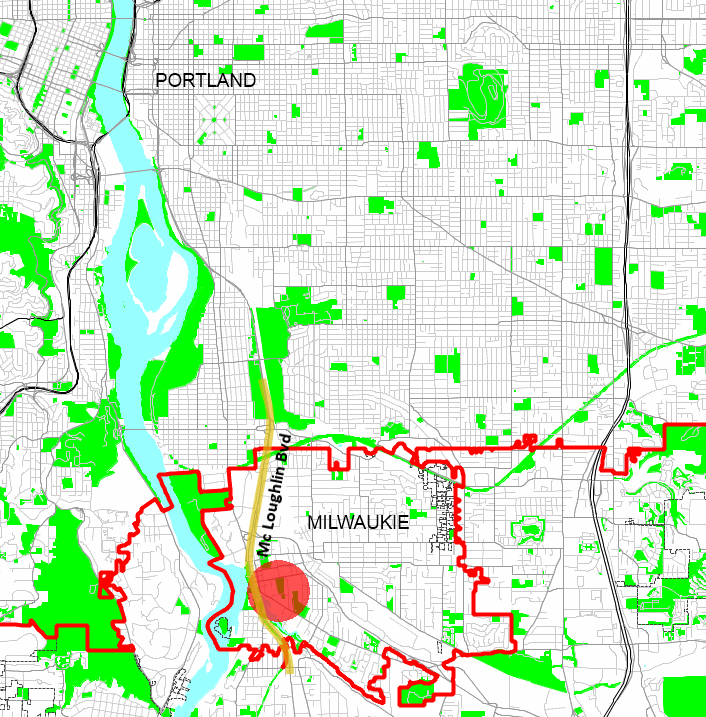 Milwaukie is part of METRO, the metropolitan governance system of Portland, and also of its planning system, based on the Oregon land law, one of the closest in concept to the Spanish law in terms of growth control despite important differences. The city center has a density that would be defines as reduced nearly anywhere in Europe, with little multifamily housing (of recent construction). Centrality depends on businesses, City Hall dependencies and a retail strip based on the automobile. The rest of the municipality can be describe as a vast array of single family housing with a reduced density from an European perspective (about 10 houses per hectare, which is about four per acre, in the densest areas). The Metro 2040 Growth Concept is the Plan for metropolitan Portland, defining the guidelines for growth control. The Plan separates urban from urban growth land, and by exclusion there is also an implicit definition of the land not to be urbanized. 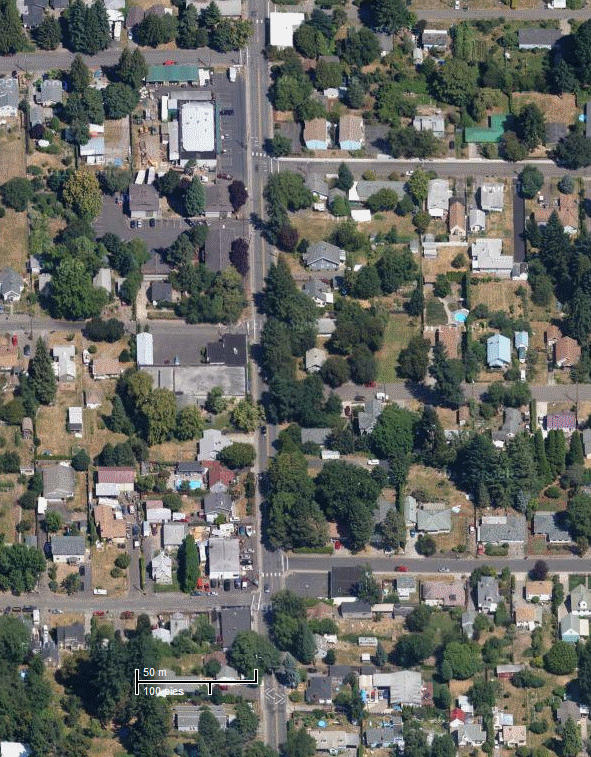 The effective status of the land in terms of roads and infrastructures has led to Milwaukie being considered entirely urban. 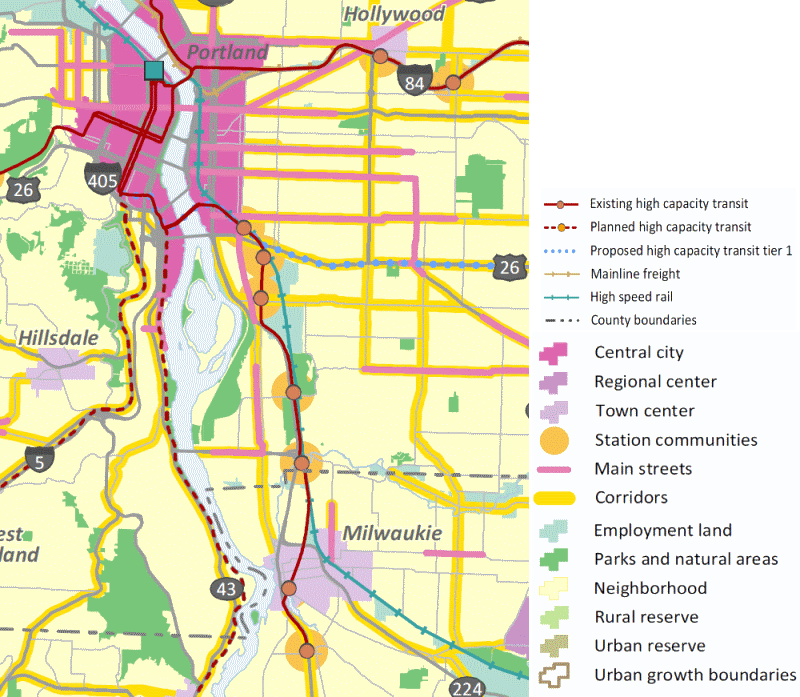 The central core is considered a Town Center (third scale centrality), integrating an existing high capacity transit line (rail) and a prevision for future transportation corridors. The Plan also defines two streets as Main Streets (retail concentration areas), and integrates the plans to convert the current rail line to southern Oregon in a high speed line. The Town Center, as well as the Main Streets, are still projects. The designated Main Streets are today low density roads in which the transformation has still to be started, with workshops currently being held as a public participation tool. The historical core of Milwaukie ; on the left the Willamette river. On the image center is the City Hall, and along McLaughlin Bvd (the large street by the shore) the parking lots serving stores and offices are visible. 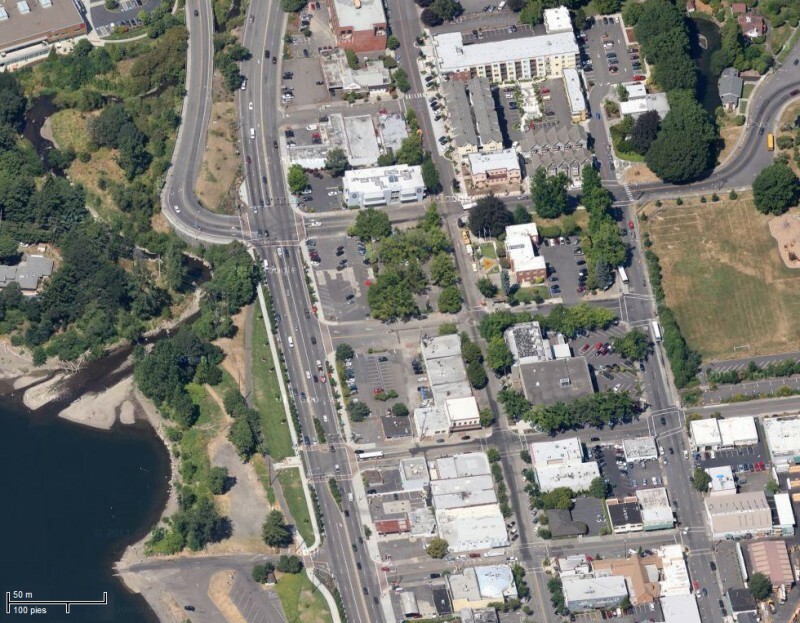 Recent multifamily apartment buildings can be seen on the upper part of the image. – A strong link with the social and economic dynamics of the whole metropolitan area. The competition with the center and the rest of the cities is played according to the position in the matrix defined by access, price and real qualities the city can offer. – The firs growth surges come usually while the city has not developed administrative control or structural planning visions, and this makes indiscriminate sprawl more likely. The Plan becomes a remediation instrument. – When cities consolidate their position in the metropolitan area, the Plan plays a more complex role, integrating the sustainable development issues not previously considered. It is not just social or environmental issues that have to be addressed, but also economic ones. The cost of maintaining in good state of repair roads and infrastructures is reduced during boom periods in which there are high fiscal revenues from permits; but they grow with time and often there is no sound and balance economic scheme to cope with that issue. Low density urban tissues can be especially onerous.